In their new book, City academics Professor B.M. Azizur Rahman and Dr Arti Agrawal apply Finite Element Modelling (FEM) approaches and techniques to characterise photonic devices. The science of photonics embraces a diverse cluster of components, devices and technologies involving the manipulation (including generation, amplification, modulation and detection) of light. The Finite Element Method (FEM) is one of the most powerful numerical approaches utilised by engineers developing photonic devices and components. FEM can be used to model and simulate these components and analyse how they will behave in response to a variety of external influences. Professor of Photonics, Professor B.M. Azizur Rahman and Dr Arti Agrawal, have been carrying out research into photonics using FEM approaches. 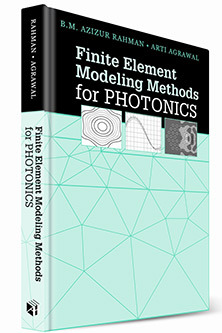 They have recently published a definitive study titled 'Finite Element Modeling Methods for Photonics' (Artech House). Professor Rahman, who had the honour of being elected a Fellow of the Optical Society of America (OSA) last year, says the book will be of assistance to readers in making the connection between mathematical concepts and the computer code necessary for the finite element method which can be applied to a range of optical waveguides and photonic structures. "The book provides a comprehensive description of the formulation and applications of FEM in photonic applications including sensing, imaging, astronomy and biomedical R&D". "Our book brings together all the developments in FEM in one place for the photonics community. The FEM includes model solutions, time domain and physical effects. All of these come together in one place. So even though the method has developed over decades, the reader can look at this one book and get all of the developments that are necessary for modelling at this point in time and do modelling at its most advanced stages." 'Finite Element Modelling Methods for Photonics' will be formally launched on 4 September at 5:30pm in the Convocation Suite. The launch follows a half-day workshop on Plasmonics. Please visit this link for further information about the book.